Perform "Inspection After Repairs" after replacing the fuel delivery pipe assembly LH (fuel pressure sensor) (See page ). (a) Install a new O-ring, new No. 1 fuel injector back-up ring, new No. 2 fuel injector back-up ring and new No. 3 fuel injector back-up ring to the fuel pipe plug sub-assembly as shown in the illustration. Check that there is no foreign matter or damage on the O-ring groove of the fuel pipe plug sub-assembly. Check that the No. 1 fuel injector back-up ring and No. 3 fuel injector back-up ring are installed in the correct orientation. Make sure that the No. 1 fuel injector back-up ring, No. 2 fuel injector back-up ring, No. 3 fuel injector back-up ring and O-ring are installed in the correct order. Check that the alignment of the No. 1 fuel injector back-up ring is not overlapped or stretched as shown in the illustration. After installing the O-ring, check that it is not contaminated with foreign matter and is not damaged. (b) Secure the fuel delivery pipe assembly LH in a vise between aluminum plates. 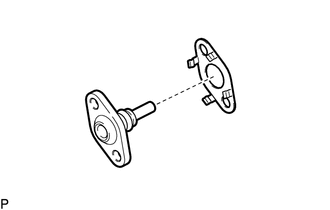 (c) Install a new gasket to the fuel pipe plug sub-assembly as shown in the illustration. (d) Using a 5 mm hexagon wrench, install the fuel pipe plug sub-assembly to the fuel delivery pipe assembly LH with the 2 bolts. (e) Install a new dust cap sub-assembly to the fuel pipe plug sub-assembly. Do not remove the fuel pressure sensor from the fuel delivery pipe sub-assembly LH. If a fuel pressure sensor is removed, replace the fuel delivery pipe sub-assembly LH (fuel pressure sensor) with a new one.